that is no longer an anchor. now resonates with the filaments of my mind. until they pile up in a wash of vinegar. Bring forth gratitude with this powerful video of a Lotus opening up, petal by petal, not tearing apart, giving and receiving prana, the life force within us and around us. Place a block lengthwise under one end of a bolster to prop it up on an incline, add another block under bolster for stability. We used the wall in this week’s class placing the bolster at a higher elevation. 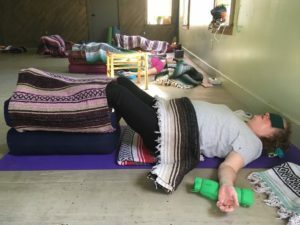 Place a double-fold blanket on floor next to low end of bolster and a long rolled blanket on top next to bolster (for sacral support). Sit with your back to the short, low end of the bolster. Place two blocks where your knees will rest (can top with a soft blanket or use other props as necessary for propping knees) Bring your legs into Bound Angle Pose with the soles of your feet together. Wrap a blanket around your feet to create a feeling of containment. Lie back on the bolster. Place supports under your arms so that they are not dangling and there is no feeling of stretch in the chest. Stay in the pose for 10 minutes. Place one blanket, larger rectangle shape down lengthwise on mat, then another blanket on top but fold over top end to create a pillow for the head and neck. 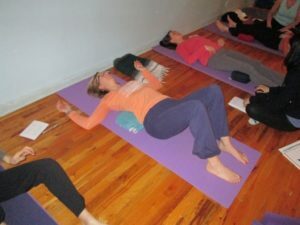 As you recline over the blankets, bring the hips to the floor. Knees bend touching, feet wide on mat. Stay for at least 5 minutes. 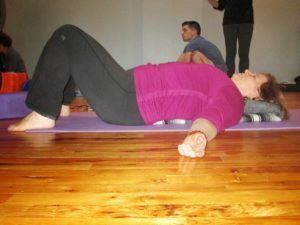 Benefits: Stretches the torso and provides a gentle twist which allows a release in tension in the lower back area. Emphasis on three-part breath. Elongates side body. Create a bolster fold from one blanket. Fold a blanket into smaller rectangle from a a full half fold. Lay flat on floor and fold in thirds, the final third folding under (s-fold) then fold 1/3 in and other third in with fringe on top third. Lie on right side with hip at the base of the blanket. Torso should rest on the blanket. Right arm rest on the floor with the palm up. The left arm can reach over the head to increase the stretch. Close your eyes and allow your body to relax and release any stress or tension. Slowly sit up and switch sides for the same amount of time.